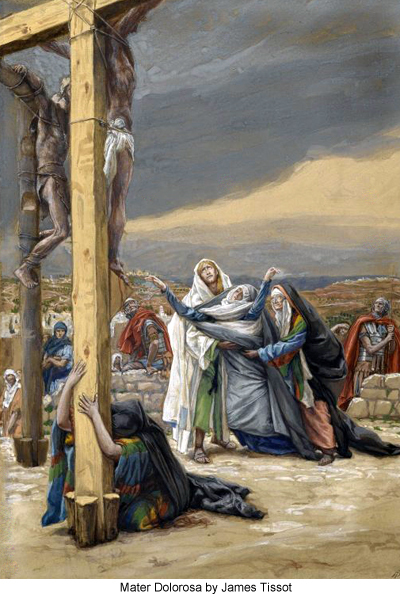 What Was The Crucifixion Really Like? In this sorrowful story, we read the harrowing details of Jesus final hours of life on Urantia-details heretofore unknown before The Urantia Book. Through it all, Jesus' love and compassion-for the women who ministered to him and to the brigand on the cross next to him-stands in stark contrast to the horror that was unfolding during this "day of tragedy and sorrow for a vast universe..."
187:0.3 What Jesus is now about to do, submit to death on the cross, he does of his own free will. In foretelling this experience, he said: "The Father loves and sustains me because I am willing to lay down my life. But I will take it up again. No one takes my life away from me—I lay it down of myself. I have authority to lay it down, and I have authority to take it up. I have received such a commandment from my Father." 187:1.2 According to custom the captain led the procession, carrying small white boards on which had been written with charcoal the names of the criminals and the nature of the crimes for which they had been condemned. For the two thieves the centurion had notices which gave their names, underneath which was written the one word, "Brigand." It was the custom, after the victim had been nailed to the crossbeam and hoisted to his place on the upright timber, to nail this notice to the top of the cross, just above the head of the criminal, that all witnesses might know for what crime the condemned man was being crucified. The legend which the centurion carried to put on the cross of Jesus had been written by Pilate himself in Latin, Greek and Aramaic, and it read: "Jesus of Nazareth—the king of the Jews." 187:1.4 Ordinarily, it was the custom to journey to Golgotha by the longest road in order that a large number of persons might view the condemned criminal, but on this day they went by the most direct route to the Damascus gate, which led out of the city to the north, and following this road, they soon arrived at Golgotha, the official crucifixion site of Jerusalem. Beyond Golgotha were the villas of the wealthy, and on the other side of the road were the tombs of many well-to- do Jews. 187:1.6 As the death procession passed along the narrow streets of Jerusalem, many of the tenderhearted Jewish women who had heard Jesus' words of good cheer and compassion, and who knew of his life of loving ministry, could not refrain from weeping when they saw him being led forth to such an ignoble death. As he passed by, many of these women bewailed and lamented. And when some of them even dared to follow along by his side, the Master turned his head toward them and said: "Daughters of Jerusalem, weep not for me, but rather weep for yourselves and for your children. My work is about done—soon I go to my Father—but the times of terrible trouble for Jerusalem are just beginning. Behold, the days are coming in which you shall say: Blessed are the barren and those whose breasts have never suckled their young. In those days will you pray the rocks of the hills to fall on you in order that you may be delivered from the terrors of your troubles." 187:1.9 Shortly after passing through the gate on the way out of the city, as Jesus staggered on bearing the crossbeam, his physical strength momentarily gave way, and he fell beneath the weight of his heavy burden. The soldiers shouted at him and kicked him, but he could not arise. When the captain saw this, knowing what Jesus had already endured, he commanded the soldiers to desist. 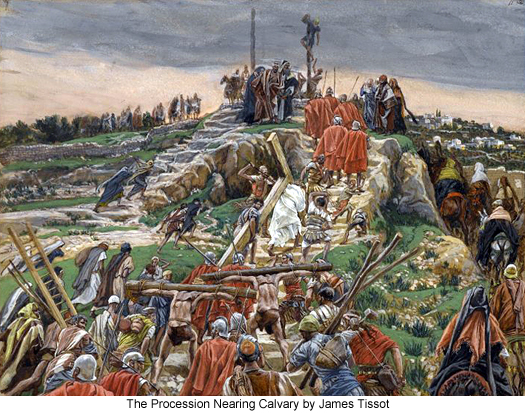 Then he ordered a passerby, one Simon from Cyrene to take the crossbeam from Jesus' shoulders and compelled him to carry it the rest of the way to Golgotha. 187:2.1 The soldiers first bound the Master's arms with cords to the crossbeam, and then they nailed his hands to the wood. When they had hoisted this crossbeam up on the post, and after they had nailed it securely to the upright timber of the cross, they bound a nd nailed his feet to the wood, using one long nail to penetrate both feet. The upright timber had a large peg, inserted at the proper height, which served as a sort of saddle for supporting the body weight. 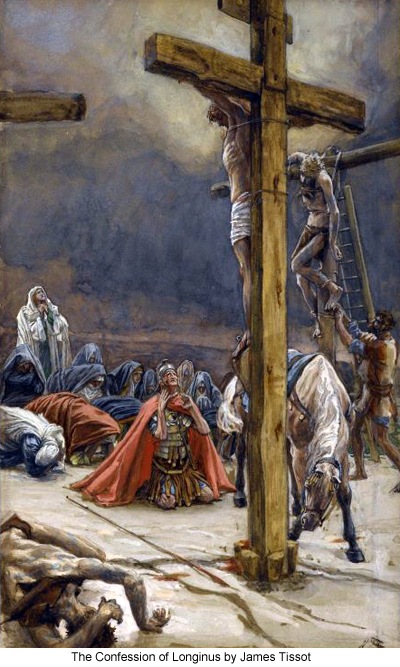 The cross was not high, the Master's feet being only about three feet from the ground. He was therefore able to hear all that was said of him in derision and could plainly see the expression on the faces of all those who so thoughtlessly mocked him. And also could those present easily hear all that Jesus said during these hours of lingering torture and slow death. 187:2.5 After the Master was hoisted on the cross, the captain nailed the title up above his head, and it read in three languages," Jesus of Nazareth—the King of the Jews." The Jews were infuriated by this believed insult. But Pilate was chafed by their disrespectful manner; he felt he had been intimidated and humiliated, and he took this method of obtaining petty revenge. He could have written "Jesus, a rebel." But he well knew how these Jerusalem Jews detested the very name of Nazareth, and he was determined thus to humiliate them. He knew that they would also be cut to the very quick by seeing this executed Galilean called "The King of the Jews." 187:3.2 Standing near the cross at one time or another during the crucifixion were Mary, Ruth, Jude, John, Salome (John's mother), and a group of earnest women believers including Mary the wife of Clopas and sister of Jesus' mother, Mary Magdalene, and Rebecca, onetime of Sepphoris, These and other friends of Jesus held their peace while they witnessed his great patience and fortitude and gazed upon his intense sufferings. 187:3.3 Many who passed by wagged their heads and, railing at him, said: "You who would destroy the temple and build it again in three days, save yourself. If you are the Son of God, why do you not come down from your cross?" In like manner some of the rulers of the Jews mocked him, saying, "He saved others, but himself he cannot save." Others said, "If you are the king of the Jews, come down from the cross, and we will believe in you." And later on they mocked him the more, saying: "He trusted in God to deliver him. He even claimed to be the Son of God—look at him now—crucified between two thieves." Even the two thieves also railed at him and cast reproach upon him. 187:3.6 Jesus had purposed to live without resort to his supernatural power, and he likewise elected to die as an ordinary mortal upon the cross. He had lived as a man, and he would die as a man—doing the Father's will. 187:4.7 Just after the repentant thief heard the Master's promise that they should sometime meet in Paradise, John returned from the city, bringing with him his mother and a company of almost a dozen women believers. John took up his position near Mary the mother of Jesus, supporting her. Her son Jude stood on the other side. As Jesus looked down upon this scene, it was noontide, and he said to his mother, "Woman, behold your son!" And speaking to John, he said, "My son, behold your mother!" And then he addressed them both, saying, "I desire that you depart from this place." And so John and Jude led Mary away from Golgotha. John took the mother of Jesus to the place where he tarried in Jerusalem and then hastened back to the scene of the crucifixion. After the Passover Mary returned to Bethsaida where she lived at John's home for the rest of her natural life. Mary did not live quite one year after the death of Jesus. 187:5.2 Shortly after one o'clock, amidst the increasing darkness of the fierce sandstorm, Jesus began to fail in human consciousness. His last words of mercy, forgiveness, and admonition had been spoken. His last wish—concerning the care of his mother —had been expressed. During this hour of approaching death the human mind of Jesus resorted to the repetition of many passages in the Hebrew scriptures. particularly the Psalms. The last conscious thought of the human Jesus was concerned with the repetition in his mind of a portion of the Book of Psalms now known as the twentieth, twenty-first, and twenty-second Psalms. While his lips would often move, he was too weak to utter the words as these passages, which he so well knew by heart, would pass through his mind. Only a few times did those standing by catch some utterance, such as, "I know the Lord will save his anointed," "Your hand shall find out all my enemies," and "My God, my God, why have you forsaken me?" Jesus did not for one moment entertain the slightest doubt that he had lived in accordance with the Father's will; and he never doubted that he was now laying down his life in the flesh in accordance with his Father's will. He did not feel that the Father had forsaken him; he was merely reciting in his vanishing consciousness many Scriptures, among them this twenty-second Psalm, which begins with "My God, my God, why have you forsaken me?" And this happened to be one of the three passages which were spoken with sufficient clearness to be heard by those standing by. 187:5.6 Jesus died royally—as he had lived. He freely admitted his kingship and remained master of the situation throughout the tragic day. He went willingly to his ignominious death, after he had provided for the safety of his chosen apostles. He wisely restrained Peter's trouble-making violence and provided that John might be near him right up to the end of his mortal existence. He revealed his true nature to the murderous Sanhedrin and reminded Pilate of the source of his sovereign authority as a Son of God. He started out to Golgotha bearing his own crossbeam and finished up his loving bestowal by handing over his spirit of mortal acquirement to the Paradise Father. After such a life—and at such a death—the Master could truly say, "It is finished." 187:6.2 After the death of the Master, John sent the women, in the charge of Jude, to the home of Elijah Mark, where they tarried over the Sabbath day. John himself, being well known by this time to the Roman centurion, remained at Golgotha until Joseph and Nicodemus arrived on the scene with an order from Pilate authorizing them to take possession of the body of Jesus.